I’ve been coaching 43 years and Coach Demeo’s website, clinic and concepts are at the top of my list of favorites. Its all good stuff that other similar websites/clinics charge big bucks. I have been reading from the website and receiving emails about book reviews and season updates. I use this website, books, and email updates for an opportunity to better understand the option attack. As a defensive coach I wanted to stop option teams, so I had to learn the ins and outs of and option attack. Through your books I have found myself really understanding how offensive want to attack my defenses. Also, when I need a pick for the day I will go through the website and find my daily motivation and share that with my players and coaches. Coach Demeo, We went to the triple gun offense this year and the results we had were great. We had come off a year where we had difficulty in running the ball. We went to the triple gun in the spring. I stumbled on to the website last spring and began checking it everyday and still do. I try to gather as much information as I can daily. In the triple gun you have the best of both worlds shotgun and a downhill agressive running attack. We played or way into the play-offs this year and in our play-off game had the number 4 ranked team on the ropes as we took the lead 32-31 with 48 seconds left. We eventtually were defeated by a field goal with six seconds left. I truly believe that we would not have been in that situation if not for the attack of the triple gun. We have several returning starters and we cant wait until spring ball. Our coaches are excited and also cant wait until spring. I am also wanting to implement the jet sweep with our attack and think it will be a great compliment. We just finished our first year in the Gun Triple after years in the SB Veer. Regional runner-up and 8 wins (again). Much better offensively though. (331 yds/gm & 31.5 pts) We have just started with the gun triple, but it was a big success for us. We went to the clinic, read the books, bought the videos and use the website for solutions. My advice: keep it simple and come to the clinic. This year we switched to the triple gun and scored a school record 340pts. In addition we won the regular season championship, even though we lost in our county finals we had the third best season in school history! We followed the plan exactly and it was incredible! We rushed the ball for over 3000 yds and threw for anther 1,000. We did something to our menu but it was Tony’s offense for certain. (Watched him speak at the Glazier clinic in Baltimore) When are we getting a new book or video! Coach DeMeo’s Gun Triple Offense was the key component to our offensive success. My run offense is premised on his creation. Our small, private school with small, quick athletes has slayed more than it’s share of “giants” with the Gun Triple. I have never had so much fun in my coaching career as I do now running Coach DeMeo’s system. His website provides juicy tidbits of info that are helpful for those “devils in the details…” The video clips provide wonderful insight into creative ways to attack defenses. The e-mail updates are especially valuable to me. It is fun to compare our stats with U of Charleston-WV…eerily similar. UC triple guy for years till i met TD at his clinic two years ago.we were welcomed from out of country like kings.He and his staff were very accomodating and remain so.we have gone 20-1 since i met Tony and although he says “Oz never gave anything to the Tin Man” he has been a huge part of our coontinued success.back to back championships including the equivalent of your state title.the true genius of his philosphy is combining Gun Triple with an innovative pas attack to produce a dynamic balanced offense.great teacher and innovator.lucky to have met the Italian Stallion. This is the offense I had been searching for my whole coaching career. It is a complete offense. Tony and his staff are great. They give you the complete offensive package and answer all your questions. Trust them, listen to them and follow their expertise. Don’t dabble in this offense, commit to the system and you will enjoy great success. Every time I visit Coach Demeo’s site I learn something new. The forum is one of the best I have ever been on because it is dealing with basically only one offensive scheme rather than many. The Gun Triple Offense is one of the best around. Though I’m a retired football coach, I would recommend to unconditionally commit to the Gun Triple’s run game and pass game. Tony is a great innovator of the game of football. Just quick note as someone who has been doing this for close to 30 plus yrs to comment to say that all of Tony Demeo’s “stuff” — and I probably purchased his 1st book many yrs ago — is outstanding and if you a student of the game I would recommend studying his ideas. Also, I’m enjoying the Web Site and e-mails. Coach Demeo published wishbone articles in coaching mags back in the early 1970s when he was the head coach at Iona & I still have them in my files. We have been option friends since then. We have been in full wishbone backfield since 1969 but we still have the utmost respect for his coaching abilities / the creativeness of option concepts as he has taken option football to another level in the Gun Option even though some may think this is a Bolshevik concept. His clinic at Charleston is outstanding. Tony is one of the great clinic speakers who is entertaining / interesting / but extremely informative & learning situation. Besides being an outstanding option coach, Coach Demeo is great individual person who is always willing to help coaches to become better. I feel honored & am thankful for the opportunities to be associated with Coach Tony Demeo as I have been a football coach over the last 45 seasons. Since attending Coach Demeo’s clinic three years ago, the Triple Gun has been a great multi-down/distance staple in our offense. Coach Demeo’s concepts have kept us competitve against a tough schedule. In fact, our qb set our school single game rushing record on just the Triple Gun. I would encourage any coach, especially young coaches to look at Coach Demeo’s offensive ideas to help strengthen their program. Tony once again conducted a fantastic clinic. It was packed with basic schemes, fundamentals as well as many little things that more experienced triple gunners can use. It was well worth the trip out to West Virginia. Looking forward to next year already to see what Tony and his staff will come up with to share. We installed the Triple Gun 2 seasons ago. Football had never existed in this 106 year old High School with a student body of 470. In our 3rd season of existence we were 2nd in the county in total offense. We made the playoffs anld lost in the 1st round to the eventual champion. However, we made it a game and scored more points against them than they gave up in any game all year. My OC and I attended Tony’s clinic last week and it was well worth the trip. We are not going to sneak up on anyone this year and the clinic provided ways to stay a step ahead. I would like to thank the UC staff for a great clinic. Great clinic. I am already looking forward to next year’s clinic. I have been to a lot of clinics in 34 years and this is one of the best. Coach Demeo and his staff do an excellent job teaching the Gun Triple and complimentaries. Their hospitality was tremendous as well. I particuliarly liked the social on Friday night and the one on one sessions with the coaches. It was a good way to talk schemes, fundamentals, drills, etc. I just wanted to say thanks for having me last weekend at your clinic. In the last 5 years, I have seen that clinic grow to be one of the largest in the state. Every year I seem to find a couple of new schools clinic that eventually will become DSV customers. I also seem to see a bunch of new schools drinking the Tony Demeo Kool Aid. I laugh and I give you a hard time about it, but the Tony Demeo Cult is large and active. I want to thank you for helping me with DSV and wish you the best in the future. I am sure you know this, but your coaching staff is one of the most professional staffs I have seen nationwide regardless of level. What you have done with your football program is amazing. When people talk about D2 programs, University of Charleston seems to always be spoken of. So once again, as always, thanks for everything. I consider you a true friend, a colleague in the coaching profession as well as a DSV customer. Just wanted to take a minute and thank you for letting us continue to work & sponsor your clinic. This year’s clinic was the best to date. We received quite a few contacts and leads that have helped us grow our business. this has been a huge success each and every year we have attended. Looking forward to a bright future with the clinic and the U. Charleston football program. It is a privilege to be a part of it. class act, class clinic and class program! Thank you for the opportunity. I had Coach Demeo and Coach Isernia at our school to install the triple and passing game. They did a great job with both the coaches and the kids. We met for an hour before practice and then went out an installed the offense. i would suggest this to anyone that wants to run this offense. What a wealth of knowledge. Thanks Tony and Ralph. Our staff attended Coach DeMeo’s clinic this year wanting to learn more about the Gun Triple Offense. After the first day of clinic speakers our staff was convinced this was the direction we wanted to go with our offense. As a result we had Coach DeMeo and Coach Isernia come to our school and help install the base foundation for running the Gun Triple Offense. The following week our team attended a Team Camp held at one of the nearby colleges. At the camp we ran the base plays that Coach DeMeo installed and were really able to see the advantages of running the Gun Triple Offense. Not only do teams have to defend one of the best running plays in football but they also have to defend the pass. I would encourage everyone to attend the Charleston Clinic and if possible to take advantage of Coach DeMeo’s instructional camp. I would like to thank the UC staff for a great clinic and camp. Tony Demeo is quite simply one of the most down to earth football geniuses I have ever met or been around in 35 years of coaching this great game. He will always take the time to talk with you on football related questions or just to share ideas and stories about the game. His website, articles, and clinic talks have always influenced my ideas and thoughts about coaching, about leadership, and about motivation. Football NEEDS more Tony Demeos! He is truly what this game is all about. Thanks Tony! I wanted to let you know we incorporated your quick game in the pistol as well as reverse, and bubble. We spent 100% of our non-goalline and/or short yardage snaps in pistol! This was a tremendous break from my background of under center option. I just remember you coming over to me and asking “Are you in pistol yet?” I was reluctant to embrace it while in Wisconsin. Anyway, I wanted to thank you for the time you spent at Superior with their team and myself. Our success was directly as a result of what I learned from you and Coach Isernia while in Wisconsin. We litterally won two games because of Quick Fade and the other packages we learned from you certainly played a large role in our success. Again, thanks. My name is Boone Copeland and I am the Head football coach at Lawton Eisenhower in Lawton, Okla. We just completed our second year in the triple gun offense and the results were tremendous compared to our first year. We attended your presentation in Dallas at the Glazier clinic and made some changes based on your presentation. We were the second leading rushing team in the state of Okla. In the large class right at 300 rushing yards a game and had two backs over 1000 yards. We have used Coach Demeo’s Triple Gun offense for the last three seasons at Bullitt Central High School in Kentucky. During that time, BC has posted back to back to back winning seasons for the first time in school history (forty years of football). We have set the school scoring record in each of those three seasons. I have coached long enough to realize their is NO “magic” offense out there, but this is one that fit our program perfectly. We have had three straights seasons with our fullback rushing for over 1000 yards (08 – 1,300: 09 – 1400, and 10 1500) In that time our QB has amassed 2,500 yards passing and 800 yards rushing and our Wings have averaged around 350 a piece a year. This will be year one in the Triple Gun. I am a new hire as head coach but was an assistant for the previous coach where we ran the Tony Franklin System. Having an option background, I have been following the Triple Gun for a couple of years and made the switch at my first opportunity. I have done a lot of research and studying with everything I could get my hands on, Tony DeMeo’s website, books and videos as well as talking with coaches who have made the switch from the TFS to the Triple Gun. Our Booster Club brought in Tony & Ralph Isernia for a Two Day Clinic. I cannot say enough about the clinic. Tony & Ralph ran a great camp from instructing the kids and the coaches. Obviously, their knowledge and experience is immense but it is impressive on how they communicate that to the kids. I would recommend to any team to bring them in without any concern. It is a great investment and am planning on bringing them back again in order to f urther the players. With all the interest in the air raid and TFS, for a smaller price than the TFS, you get the package plus an instructional camp, not just 30 hours of dvds, plus the same support with just a phone call or email. This will be the first year that our program is running the Triple Gun. As a newly appointed head coach I researched offenses that have been successful for other programs and the Gun Triple made the most sense. I immediately called Tony and he was enlisted to clinic our coaches for one day. Prior to his arrival we had purchased and watched the McNally DVD’s. After clinicing with Tony for the day we left with not only understanding the Gun Triple but a sense of excitement and pride for this upcoming year. Tony also took the time to inspire and motivate our upcoming team. Our team went to a week long camp two days after our clinic with Tony and we were able to have success immediately. Tony has initiated phone calls to check on our progress and supported me in developing a team. The value of Tony and his philosophy is of equal or greater value than his Gun Triple. Thanks Tony!!!! I will start by saying that Tony bought Ralph and his “Triple Gun” offense to Potomac Maryland to help us “fine tune” what we had been running fior the past two years and the experience was priceless. Our players and staff learned the intricacies of the offense and we were able to get a better undertsanding of how to incorporate this offense into a game plan. Tony was tough and demanded alot from our players and they loved it!! We hope to have him back again next year!!! We will not olny be more proficent in the triple gun offense, we also became a more complete program. Thanks tony and I’ll talk to you soon!!! There is no “magic bullet” offense out there ready to defeat any and all defensive schemes. It always comes down to players making plays and above all protecting the football. The Gun triple, which Coach Demeo presents, affords an opportunity to compete versus better talent. Sooner or later of us will be in that position. Do not be swayed by successful 7 on 7 tournament summer victories. The game is meant for 11 people working together. Run correctly, the Gun Triple will be as effective as a no huddle passing game — perhaps even more. Have enjoyed the knowledge base of Coach DeMeo and Coach Isernia. Both are very confident, knowledgeable and continually helpful. One additional by-product of the Gun triple — your defense will see it everyday and be able to adjust to opponents who run option. Huge benefit! Thanks again for all your help. Last year my school (Weston, CT) had its first winning season in 8 years and won a division title with a 6-4 record. This year we went 7-3 and won the division again. CT leagues are messed up…they are based on location not size so we are small school in a giant school league, so at 7-3 we missed the playoffs by a few bonus points. But, we’ve applied your philosophy not only to the triple gun, but to defense and special teams. We always try to speak with “Unless” rules and we preach less is more. What made this year even sweeter was that we were predicted to finish dead last in our league because we were so young and tiny. Thanks again for all that you do – truely amazing. This is Eric Davis and I was the coach that visited from Indiana who was at the Superior High School Camp you instructed. I got your email from Coach Fezzey. I hope you do not mind. Anyway, I wanted to let you know we incorporated your quick game in the pistol as well as reverse, and bubble. We spent 100% of our non-goalline and/or short yardage snaps in pistol! This was a tremendous break from my background of under center option. I just remember you coming over to me and asking “Are you in pistol yet?” I was reluctant to embrace it while in Wisconsin. We just had a fantastic 2 days with Coach Demeo and Coach Isernia. Our players, coaches, youth coaches learned so much in a short time period. We have been a triple gun team for the last 3 years but there were details learned that you just can’t get from a book, clinic or video. I think we have been winging it the last few years and now we finally have a true understanding of the Triple Gun. You need to find a way to get Coach Demeo and Coach Isernia up to your school. What impressed me more than the x’s and o’s part was how they treated our kids. They coached them hard but with class. I was amazed how they bonded with our kids in such a short time period. Our players loved them. We can’t wait for the Fall! This will be our second year running the Gun Triple. Our first year we started with an understanding of the offense, but not all of the specific details and drills. Tony was a great help throughout last season. This year Tony and Ralph were enlisted to do their 2 day clinic. What an extraordinary camp! Our players feel so much better about themselves and their team. Tony and Ralph were able to bond with our player’s immediately. In only eight hours of instruction not only did our player’s have a better understanding of the offense, but our coaches did as well. Tony offered excellent lead up drills to execute his offense. Tony had great demonstrations and explanations. We will definitely use his ideas this season. Tony is one of the best teachers of the game…Not only is the triple gun offense explained in great detail, but specific drills are shown too. He does an amazing job teaching the triple gun offense. He shows exactly how each set flows into each other. Tony teaches a simple offense that is not too predictable. Tony’s “unless” rules are easy to teach and understand. Our QB’s had a great understanding of the Quick Game and its conversion patterns. We have discussed using incorporating the unless rules into our defense as well. Ralph Isernia was excellent. The improvement in the line from making the calls and executing the blocking schemes was incredible. After only 2 days at camp the kids were making the calls as though they had done it together for an entire season. I believe the system really works! This is an ATD (Attention To Detail) offense, Tony and Ralph really make sure that you know the details of the offense before they leave. Tony always seems a step ahead of the defense. Looking forward to running it again this fall. I just wanted to say thank you again for everything you have done for our staff and our players this week. We had our first “Tony DeMeo- Triple Gun Football Camp”. Hopefully we can continue this for years to come. It was a tremendous experience. Coach, I hope you enjoyed your time in Iowa. It is a memory that will last a lifetime for me. I have spent thousands of dollars on coaching materials over the past decade and in 4 practices I learned much more about the offense than any book or dvd could provide. I have no doubt in my mind that it is the best money I have ever spent on our program. Not only did he spend the time with the players at our camp, the time after the camp with the coaches was priceless. I have been an option coach for the three year’s and I have bought every piece of literature and coaching DVD’s I could get my hands on about the triple option. Last season we made the switch to more of a gun offense and had tremendous success. However, I love option football and didn’t want to lose that aspect of our offense. So, after evaluating all of the other Gun Option Coaches out there the DeMeo Triple Gun offense stood alone as the best. As the saying goes Coach DeMeo’s gun option offense is often imitated but never duplicated. I went to the McNally retreat and also listened to TD at the Chicago Glazier clinic. No matter how many times I read the books or watched the dvd’s there is only so much that you can really understand on your own. In order to get the true “Triple Gun” experience I highly recommend hiring Coach to run a 4 practice camp. Proud to be a Triple Gunner! Coach Demeo is the FINEST!!! My staff, athletes and myself were thoroughly impressed with coaches two day clinic. He is a true master at his craft and left us feeling like part of the Triple Gun family. If you have not had the privilege of seeing Coach Demeo work then you are really missing out. Within two days (four sessions) he had our athletes whipped into shape and running the Triple Gun. He answered our many questions and provided details that no book or film can ever provide. If you are serious about running the triple then you need to get coach out to do a clinic for you right away. Thank you again Coach. We truly enjoyed having you impart your knowledge on us and will look forward to having you back next summer. I saw Coach Demeo at a glazier clinic this year and he briefly mentioned a book that he had written entitled “To be number one, you must be one”. I bought the book at the clinic and read it that weekend. Every summer I have our varsity and sophomore teams read a book and after reading Coach Demeo’s book, I decided that our players needed to read it as well. It was a great was for our guys to learn about what makes a team an actual TEAM. Coach Demeo was more than gracious in helping me get these books on short notice. It was greatly appreciated and our players and coaches got a lot out of the book. Here is the game film that Coach Bob Bridge promised you. Some good, some bad, and some ugly. Right now we are 5-1. Since coming out to your clinic with Coach Bridge and installing this offense we went from 7-23 my 1st 3 yrs to 41-21 our last 5/6. On behalf of the Bishop Dwenger Football Program , I just wanted to pass along our sincere thanks for all your help this season. In early June, we installed your version of the Triple Option during our Summer Team Camp. We had previously been a pretty successful Shotgun Veer team (a record of 116-31 and 3 State Finals appearances in Head Coach Chris Svarczkopf’s 11 seasons), so the conversion to your Triple Gun was not a massive learning curve, but nonetheless it was a major leap of faith for us. I am very pleased to report that it has been a resounding success. On Saturday we played for the Indiana Class 4A State Title at the home of the Indianapolis Colts, Lucas Oil Stadium, and went toe to toe with the undefeated #1 ranked team in the state, only to come away with a 28-27 defeat (a replay of the game can be viewed here). It surely was a difficult loss, but an overwhelmingly successful season as well. We finished with a record of 11-4, competing against arguably one of the best schedules in the state. We entered the season with a lot of question marks on offense – a young offensive line, an inexperienced backfield, only 1 returning starter at receiver, and a QB coming off a missed Junior season due to ACL surgery. We finished the season with over 5,000 yards of total offense (2,577 yards rushing, 2,727 yards passing – BALANCE!) and scored at least 24 points in 14 of our 15 games. We had 440 yards of total offense in the State Championship Game, which set a state record for combined total yards in a 4A Championship Game. I am exceptionally proud of all that we accomplished with our offense this year, and wanted to let you know that we are very grateful for all your help. We are probably just scratching the surface of our Triple Gun knowledge at this point, and we look forward to learning more from you this off-season. Coach Demeo’s offensive package has systemic flexibility that allows for the play-caller to be correct always. You can never be a play behind as an offensive coordinator compared to the archaic cat-and-mouse game to which many systems fall victim. His presentations cover every component from football philosophy, scheme and plays, video, to drills and calls– a complete presentation from a cutting edge coach who compresses many eras of football knowledge into a seamless package that is refined and concise. It is well worth the money to have him visit your school and receive private instruction as a staff. We had an absolutely fantastic two day triple gun training experience with Coach DeMeo at BCHS last year and the overall results were extremely positive. As a result, our son just completed another training session this spring and it was totally worth the investment! Coach DeMeo has tremendous overall knowledge, experience, teaching skills and a true passion for game. All the best and we look forward to see you again next year. Thanks Coach! Coach, myself, my staff, and athletes want to thank you for an outstanding two days of camp. I know as a staff we have gained much knowledge and confidence in our abilities to coach the triple gun offense! And to a man our athletes have verbalized that they have gained valuable knowledge and technique necessary to perform in this offense. It’s unbelievable how far we came in only 2 days! Take care and again thank you. program to the highest level of competition. I played football as an offensive tackle for Tony Demeo in 1981 at Mercyhurst college, where created an all-freshman team that felt like a well-oiled machine. I left to spend 23 years in the military as a counselor, a Deep Sea diver, , a Master Explosives Ordnance Disposal (EOD) Tech, and finally as an EOD member of the SEAL Teams. 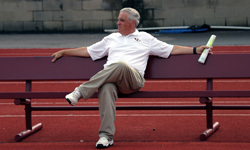 I never spent a day or met a challenge where Coach Demeo’s influence didn’t play a part. Thanks coach! Thanks for the kind words in the inscription of the book. I found it in the mailbox last night and immediately read it cover to cover. Your writing style perfectly matches your entertaining style of speaking. I’m sure that I will reference the book for years to come; both in my administrative and coaching roles. This past fall we Triple-Gunned our way to the best football season Superior has seen in 25 years. We put up huge offensive numbers on our way to an 11-1 season. We lost a close one to the eventual state champion in the quarterfinals. Thank you for the guidance you have provided us throughout the years. I’m really looking forward to your webinar series—especially the opportunity to look inside your brain as you discuss how to attack specific defenses. I really like the book a lot and think it’s beneficial for anyone looking to enhance leadership capabilities. We will be using the book as part of our leadership training program at Columbia High School. I will be purchasing copies of your book for all our licensees and management team at Parma Pizza & Grill. What a practical way to instill leadership skills, priceless tool that can be referred to over and over through out anyones life or career, business leaders, parents, coaches and entrepreneurs. Thank you for allowing me to visit your summer team clinic in Indiana this past July. I want to complement you on your implementation and overall style of installing and teaching of the triple gun option offense. As a 20 year veteran coach and educator of High School students, the understanding of any new subject can be overwhelming to young people. Simply put, I was extremely impressed with your teaching style. Watching the immediate success on the field in the short time frame demonstrates your passion, patience but more importantly your competence. As the new Offensive Coordinator of SUNY @ Erie Community College (Buffalo, NY). We will be using your teaching style in the installation of the triple gun offense. We expect to an immediate impact in the offense from spring ball. I eagerly look forward to the season and running the triple gun. Thank you once again. Tony, we want to thank you so much for the two day install you did for us during camp in July. We feel like you cut out about five years of learning curve for the coaching staff. The schemes are terrifically simple, so it’s easy to dress them up differently without the kids losing the concept. It looks like we have a million plays out of the five or six that we actually have. The passing game is also greatly simplified and much more efficient; we spend a lot more time practicing throws that we will be making in every game. It was difficult for us to give up a system that we were successful with, but the quality of your system and your coaching/teaching has made it a very smooth transition. The coaches love it, and more importantly, the kids love it. Thanks again. Coach, I saw on your blog that you wanted Week 1 Results from “Triple Gunners”. Let me preface by saying that last year we went 3-6 and lost our opener to the eventual undefeated District Champions 31-14. We had run an Auburn-style spread since 2012, although I have a Flexbone background that was enhanced by some of your older videos. This offseason, I got an Option Central subscription, purchased a couple of your DVDs, and coached my staff up on the Triple Gun. We installed a good amount of it this summer with our players. On Friday we defeated that same traditional powerhouse 31-22. We outgained them by 100 yards and kept their offense off the field, running 68 plays to their 51. We ran Gun Triple 20+ times, hurt them on the perimeter by pitching the ball and running the Jet Sweep, completed multiple Hitches and Sticks, and hit the Stretch Pass for 2 long gains and 1 Pass Interference. They cancelled the Dive and the QB for 3 quarters before switching fronts, at which point we gained 100+ yards in the 4th quarter in the Dive Phase, including a 75 yard TD by our backup tailback against a very tired defense. That’s my long-winded way of saying Thank You for creating and sharing this great offense. Question: Our 31 points came on 5 TDs. We went 1-3 on XPs and 0-2 on two-point conversions. Did you find any plays in the Triple Gun Offense that lent themselves to being great two-point conversion plays? We tried Slice out of Double Slot and Fade out of 3 x 1, both of which had a chance, but we just didn’t execute.